In the southern part of the Northern Hemisphere this week, spring begins to manifest itself in fields and meadows as wild flowers bloom and tender new buds push out into the sunlight. You may see hummingbirds and bees working the blossoms of morning glories and trumpet vines. How appropriate, then, that near the apex of the night sky this week is a star cluster just visible to the naked eye that goes by the name, the Beehive Cluster. 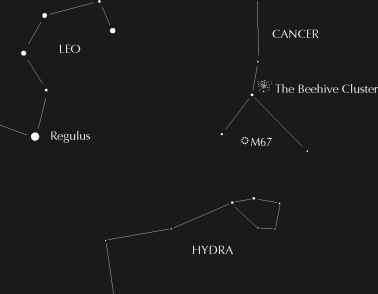 Located in the faint constellation Cancer the Crab, the Beehive, also known by its more ancient name, the Praesepe (the Latin root for manger), is one of the nearest and largest open clusters. It can easily be seen with the unaided eye in a dark sky as an oval glow over 1° across (the width of two full Moons side by side). Closer examination with binoculars or a low-power telescope reveals an aggregate of stars, like a chaotic throng of buzzing bees. The Beehive Cluster, looking overhead in the Northern Hemisphere, April 6, about 9 p.m.
'Little Cloud.' An older reference comes from Aratus of Soli (court poet of Antigonus I, king of Macedonia) who, around 250 b.c, referred to it by a similar name, the 'Little Mist.' Throughout ancient times, from Homer to the Roman scholar Pliny, the Praesepe was allegedly used to indicate changes in the weather. If the cluster appeared bright and sparkling, the weather would be fair. If, however, it appeared darkened in a clear sky, this was taken to mean that a storm was in the offing. Of course, no one then knew that the Praesepe was in fact a star cluster until Galileo turned his telescope on the object in 1610, revealing a tangle of 36 bright stars. In fact, modern counts bring the number up to nearly 400, though most of these stars are extremely faint. Any small telescope at low magnification should reveal between 100 and 150 members. Because of the cluster's large apparent diameter, binoculars may present a more pleasing view than a telescope. While you're in the area, be sure to look 9° south of the Beehive - or about 2° west of Alpha (a) Cancri - for another star cluster: M67. This is a rich, compact cluster spanning about 1A° of sky and containing several hundred stars fainter than magnitude 10. It's visible in binoculars as a distinctly granular patch of gray light. In any modest sized telescope, you should have no trouble seeing at least 60 of the brighter stars. M67 is one of the oldest known open clusters in the Galaxy: about 4 billion years old, which is approximately the same age as our Sun. 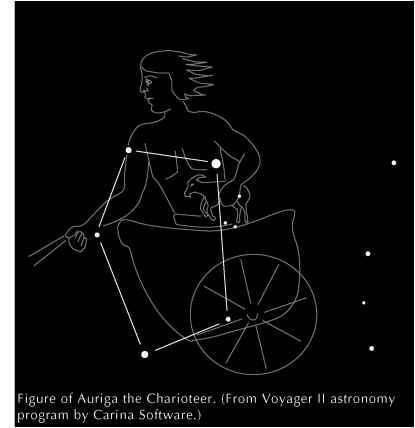 • The Southern Cross is on the meridian around midnight for southern observers. • Bright meteors seen this week and next may be attributable to the minor meteor shower the Virginids. This shower exhibits several maxima during its active period throughout March and April, during which from two to five meteors per hour may be seen. Virgo, from which the meteors appear to emanate, rises fully by 10 p.m., though more meteors will likely be seen after midnight.